A couple of Saturdays ago we experienced the beginning of a typical Midwest midwinter thaw. With 9-12 inches of snow cover, clouds parted, the sun came out, and the temperature rose above freezing. As snow began to melt the cool air quickly became saturated. As the afternoon and evening wore on, it became increasingly foggy. Overnight the temperature dipped below freezing. The moisture in the air condensed on frozen branches and on the dried remains of last summer's herbaceous growth, forming the spiky ice crystals known as hoarfrost. We saw no sign of hoarfrost in our neighborhood that Sunday morning. I had a couple of errands to run though, and while I was out I found myself enchanted by the beauty of the landscape transformed by hoarfrost. I wished I'd brought my camera. Then the sun came out. Though a welcome sight, I knew its appearance would quickly melt the frost. Morning errands were finished, followed by a dash home for the camera, with hopes of snapping a few photos before the hoarfrost vanished. While it wasn't quite as dramatic as earlier that morning before the sun came out, I was glad to be able to capture a few shots before it was gone. 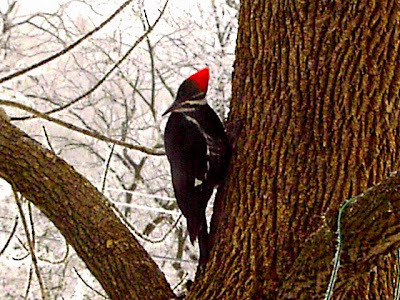 Last weekend as he washed breakfast dishes, Mom's Garden Buddy spotted two Pileated Woodpeckers* visiting the ash tree off the deck, where suet feeders hang during the winter. One flew off before Mom could grab the camera, but she managed to get a couple of nice shots of this one through the kitchen window. Being rather shy birds who don't often venture far from the edge of the woods, they're more often heard than seen. Kudos, and thanks to Mom for sharing these photos, and to her Garden Buddy for being so observant! *Writing the brief post to accompany Mom's photos, I once again became curious about capitalization of common names of birds. For example, I've seen Pileated Woodpecker, Pileated woodpecker, and pileated woodpecker in various reference materials in the past. I wondered if there was a definitive 'rule' on proper capitalization of common bird names, and this time I decided to check it out. When in doubt, look it up in a dictionary, right? 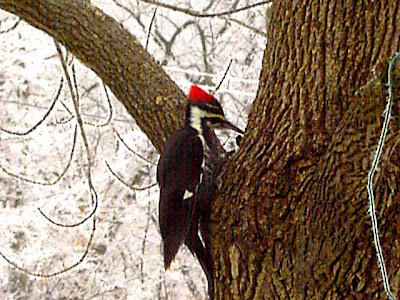 In that case, the correct capitalization is no capitalization - pileated woodpecker. It turns out this can be a rather controversial subject among ornithologists. If you're curious about the controversy, see here, and here, for examples of the many articles I found on this subject. What was the conclusion after spending more time than I'll admit researching this matter? Nothing definitive, only more evidence that I am indeed a geek. Or is it Geek. . . !? Not surprisingly, nothing is blooming in our Chicago-area garden in January. The snow cover we've had since December had accumulated to about a foot, and is now disappearing during a welcome January thaw. There are a few blooms in the basement 'greenhouse,' like this wax begonia. I almost didn't bring in this planter. Wax begonias are cheap and common. Replacing the three in this leaky old watering can planter would have set me back less than $1.00. Still, after several light frosts, this planter came inside, too sweet to let it die. Last year was the first time I grew the ubiquitous wax begonia. Despite how common they are, I've decided I like them after all. Even in the hottest part of summer, they needed watering once a week or less. More tolerant of spring deluges, they survived last year's without rotting (more than I can say for some of the other, fancier begonias who shall remain nameless.) Wax begonias added color to our shady garden and containers from May through November. That's what I call Non Stop! Not actually a bloom, this bromeliad bract is welcome in January. Athough it's not as fresh as it was a few months ago, it's still pretty. I wasn't sure how these torenias would fare over the winter in the basement. . . so far, so good! The dragon wing begonias have been overwintered for three years. They bloom like crazy all winter. For more Bloom Day posts, please visit Carol at May Dreams Gardens, who hosts this popular favorite every month. Just after midnight New Year's morning, George heard nature's call and we headed outdoors. As you may imagine, I was a bit grumbly, since it was only about 4 degrees F, and outdoors was not where I wanted to be. The grumbliness quickly lifted. The night was truly magical. I came back in for the camera. Without adjusting for the low light, the shutter clicked a few times before we headed back in, where a lovely glass of champagne and a warm afghan were waiting. Thank you George, I'm glad we didn't miss it. This month gardeners across Chicagoland will begin voting for their favorite prairie seed for One Seed Chicago and the winning seed will be sent to them through the mail. In partnership with GreenNet, Chicago's community greening coalition, One Seed Chicago selected the three candidates Chicagoans will choose from. This year the winning seed will be from a plant that was once commonly found in the prairies around Chicago, but that is now rare in the wild outside of prairie restoration projects and cultivated gardens. Once established this native plant will require little water, is less prone to diseases and attracts beneficial insects and birds to a garden. "Native plants attract native birds and insects and help to increase biodiversity in your garden," said Colleen Lockovitch, Director and Horticulturalist at the Lurie Garden at Millennium Park. "Our native plant friends are more adapted to their local surroundings and can handle the Chicago area's fluctuations in climate and weather." Vote from Jan 1 until April 1st. The winning seed will be announced at the annual Green and Growing Fair, April 24, 2010 at the Garfield Park Conservatory. For more information or to vote visit One Seed Chicago. One Seed Chicago is a project of NeighborSpace, Chicago’s land trust for community gardens. Entering its third year One Seed Chicago aims to build upon the success of the previous years and get even more gardeners involved. In 2009 One Seed Chicago distributed 10,000 Blue Lake Pole green bean seeds thanks to a generous donation from the Ball Horticultural Company. “The Year of the Bean,” as 2009 was called, was popular because it dovetailed with Chicagoans who rediscovered growing their own food in a recession. NeighborSpace is a nonprofit urban land trust dedicated to preserving and sustaining community managed open spaces in Chicago. Their growing network of gardens provide thousands of people the opportunity to grow fruits, vegetables and flowers; to restore habitats; and create unique gathering places in their own neighborhoods.NeighborSpace’s partners in the community can rest assured that the land will remain dedicated to conservation and their efforts will never be displaced. For more information, please visit NeighborSpace. Thank you to Mr.Brown Thumb for providing me with the press release above. Mr.Brown Thumb's working with NeighborSpace and One Seed Chicago to get the word out on this terrific project, and I'm happy doing my part to help. Which One am I Voting For? All are worthy plants. I'm all for adding natives to the garden, or growing an all-natives garden. I LOVE coneflowers and bee balm. We have species and cultivars of each in our garden. Last fall I added a few alliums too. Hazarding a guess, I suspect the lovely coneflower is likely to garner the most votes, or maybe bee balm. I'll be surprised if the onion wins. Why, you ask? Well, I'm glad you asked, and I'm happy to tell you! I voted for this pretty little allium for a few reasons. You may remember during a visit to Mom's last September, about a third of our shade garden was chewed down to the ground. Most of the coneflowers, and all the bee balm were gone. Alliums are generally avoided by deer, rabbits, and other mammalian herbivores (a/k/a rodents/garden pests,) and may even discourage pests from other plants in the garden. As if that wasn't reason enough, nodding onions (unlike coneflowers and bee balm whose native habitats are more extensive,) are native only to Northeastern Illinois. They're adaptable to full or part sun and a variety of soils. Since most of this little native's habitat has been destroyed, since bee balm and coneflowers are so much more common in gardens, and since I like to support the underdog, the lovely nodding onion gets my vote.